At 25.1cm high and 16.7cm in diameter, the Mac Pro is astonishingly small; the space it takes up is more like that of a bookshelf speaker than a desktop computer. It's definitely something to sit on your desk rather than under it. Those twin GPUs are the Mac Pro’s standout feature. To buy a similar pair of graphics cards would cost you a substantial chunk of the Mac Pro’s price, so it’s great value for money. The catch is that only a few apps can take full advantage of the dual graphics setup and if yours can’t, you’ll see little or no benefit compared to a 27in Mac, or in some tasks even a top-end 15in Retina MacBook Pro. Apple and Adobe-based broadcast-quality video editors probably stand to gain the most at the moment. 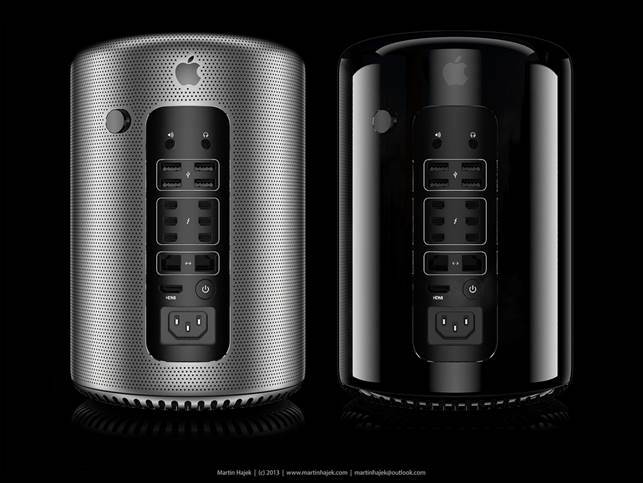 With six Thunderbolt ports, the Mac Pro can connect to as many as 36 high-speed peripherals. There are also four USB 3 ports for cheaper devices where you don’t need the absolute maximum performance, and two Gigabit Ethernet ports for networking, as well as 802.11acwifi and Bluetooth. You don’t get a keyboard and mouse included as standard, unlike with the iMac. A central feature of the Mac Pro is its extremely quiet cooling system, based on one huge fan at the top. This makes it well suited to environments where you need near-silence. The Mac Pro is the only Mac that can natively drive 4K- resolution monitors it handles up to two via Thunderbolt or six regular screens, as well as one via HDMI (something the latest Retina MacBooks also offer). OS X doesn’t yet support all the 4K screens that have reached the market: Apple currently recommends just two, the Sharp PN-K321 and the Asus PQ321Q. The HDMI port can only drive a 4K display at 24-30Hz refresh rates. One HDMI screen can also be connected on a Thunderbolt adaptor. This is also the only Mac that supports 64GB of main memory (RAM). In other respects it’s not so upgradable. Although you can reach all the parts (with some fiddly disassembly), neither the SSDs nor the GPUs are standard components, so you’re likely to be limited to Apple-specific upgrades. There’s only one SSD socket, taking a maximum of 1TB of flash memory. More SSD capacity is easy to add via Thunderbolt without compromising on speed, but there’s no realistic way to add graphics processing externally. Thunderbolt does provide a route to add-ons such as video processing boxes, though. The theoretical benefit of the AMD FirePro GPUs can’t be overstated, especially in comparison to other Macs, which all use graphics processors designed for mobile devices. The Mac Pro is ready to tackle the most high-end graphics and video work, and Apple’s Final Cut Pro X and Motion 5 apps can take full advantage. Note that Final Cut dedicates one card to rendering, with the other largely left to general tasks; how fast it feels in use will depend on how well this arrangement suits your work patterns. Usually, cramming so much into a small space would risk overheating, but the Mac Pro's logic boards are arranged around a finned prism-shaped heatsink through which cold air is drawn up from the base by the large fan at the top. As we’ve mentioned, only a few apps are designed to exploit dual graphics. That doesn’t mean others will see no gain at all: even one FirePro beats any other Mac GPU, as we saw in our games tests. On the entry-level Mac Pro’s D300 GPU, the latest version of Tomb Raider, a very demanding 3D title, ran at an average of 40.1 frames per second at a high 2560 x 1440 resolution, compared to 22.5fps for the top- end 2011 iMac (a point of comparison for users planning to upgrade) and 11.hfps for the current fastest 15in Retina MacBook Pro with its NVIDIA GeForce GT 750M graphics. As you’d expect, the Mac Pro’s CPU is also more powerful than the central processors in other Macs, but here the advantage is smaller. Intel’s high-end chips lag behind the architecture of its consumer-grade versions (such as the Core i7 CPUs in the fastest iMac, Mac mini and MacBook Pro models) and run at lower clock speeds. Even if you pay extra for the 6- or 12-core Xeons, some CPU-intensive apps, such as HandBrake, don’t run much faster on a Mac Pro than on a top-spec Retina MacBook. The Mac Pro does feel very responsive in use, partly thanks to its flash storage (SSD): there’s no option for an internal hard disk. Compared to other SSD Macs, it delivers even faster transfer rates: we saw a median write speed of 738MB/ sec, and 953MB/ sec when reading, with peaks in excess of 1GB/ sec. This means you can easily work with several 4K video streams simultaneously. But the maximum SSD size of 1TB, at Apple's somewhat inflated prices, means you’re likely to be adding lots of external storage. This is the most powerful Mac by a big margin, but others are also very capable for almost all tasks, so find out how much your particular apps will benefit before shelling out.